He writes a poem about the unicorn, but the visitation proves to be more than a one-time miracle. The unicorn returns, and is apparently searching for something. The truth finally dawns on Bianchi: the unicorn is pregnant, and what she’s searching for is a place to have her foal…fawn? Bianchi isn’t sure. But when she makes her nest in a hollow near his apple orchard, the farmer begins keeping vigil, and it is there that Giovanna, the postman’s sister covering his route that day, finds Bianchi, and finds the unicorn. Soon she’s in on the conspiracy of silence, and essentially in the unicorn’s service as much as Bianchi, though he might not have put it that way, already is. The unicorn eventually has a difficult birth, and Bianchi is there to assist, and all is well, for a while. Some secrets are impossible to keep, and the unicorn and her newborn are among them. It’s not long before reporters, animal rights activists, and unicorn hunters are snooping around and sneaking through and trampling Bianchi’s farm, but the real danger arrives with the monster, a monster in human form, as the worst ones tend to be. So that’s the plot. Trivial things, plots, or would be if one didn’t need a way to lay out what does and must happen in the course of the story. The bones, if not the flesh. Seldom if ever what the story is about. At its heart, In Calabria is a love story, and I don’t simply mean the contentious but real affection Bianchi and Giovanna come to feel for each other. There’s also healing. In time we learn why Bianchi is alone in the first place, and the tragedy that put him there. In Calabria is also a story of awe and wonder, and all that contained in a novella-sized package. It contains multitudes. Yes, I know. The monster must be defeated, the dangers averted, or else the story is about something else entirely. So let’s leave that part for the reader, where it rightly belongs. If you already know Peter Beagle’s work, and you haven’t read this book, I don’t know what to tell you, other than stop wasting time and get to it. I’m already mad at myself for waiting so long to do the same. If you don’t know Beagle’s work, then correct this error as soon as possible. Start with The Last Unicorn, or A Fine and Private Place, or The Folk of the Air, or The Innkeeper’s Song or...well, I really doubt it matters. No writer is for every reader, but if Peter Beagle isn’t for you, then I can only offer my sincere condolences. But it’s well worth your time to find out. 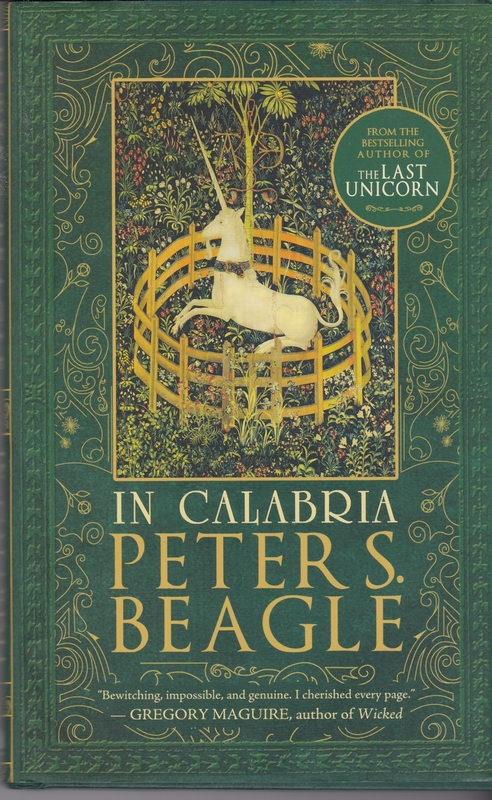 All right, I’ll cut right to it–I had planned to have a review of Peter S. Beagle’s In Calabria (Tachyon, February 2017) before now. That the book is over a year old is as good an example as any of how useless I am to anyone as a review blogger, which makes me no never mind since that was never my intention here in the first place. Once I reviewed for magazines with deadlines and everything and I never missed one, but then I was usually getting paid for it. Now I pay for my own books, I review what I want to when I want to, thanks very much, and that’s all there is to it. Ahem. Slight digression there. Regardless, I’m not ready to review the book because I’m not through reading it. That’s taking a while, and not because it’s a doorstop. It is definitely not. It’s a slim volume beautifully produced by Tachyon Publications, lovely to look at, and at first glance the sort of thing any halfway decent reader could tear through in an afternoon. So could I, if it was a book by almost anyone other than Peter Beagle. So some of you might understand that I am going slowly, savoring, and am in no bloody hurry to finish. Another reason is that I always–always–approach Beagle’s work with a bit of caution, if not trepidation. Peter Beagle is never a light read, and I never come to it lightly. I understand that I might have my heart ripped out; it’s a risk that comes with anything of emotional depth and utter truth. I’m embarrassed to say how long it took me to get to his The Innkeeper’s Song, but in my defense I did so, but long after any such review would have served either the author or the publisher’s interest nearly as much as something less reverent but more relevant and–most important–timely might have. I’ll have to give my regrets in advance here, too. Will I have it next time? Doubtful. But I’ll likely be a chapter or two closer, for what little that may be worth to anyone other than myself. Sorry (Not a Bit Sorry). Didn’t We Just Leave This Party?